Read the article and �view a short BBC documentary on Roe and Walthamstow Marshes. Viaduct 1880s. A.V. Roe’s occupancy of one of the arches circa. 1909. Group value with the second world war machine gun post nearby. Network Rail/ Lee Valley Regional Park Authority. Built by the Great Eastern Railway Company around the 1880s, the viaduct carried their line north out of Liverpool Street via Clapton Station and over the River Lea Navigation to link with the existing Lea Valley Line and the Chingford Branch. Two ragstone riverbank walls with large granite cap stones extending to approximately thirty metres on either bank may possibly be associated with the High Hill Ferry, or possibly with works to the riverbank associated with the construction of the railway bridge. 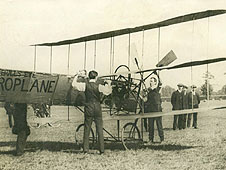 Roe's ‘Yellow Terror’ tri-plane was assembled under the arches and flew an historic 900 feet across the Walthamstow Marsh: The first Englishman to design, build and fly an all-British aeroplane. His inspiration for doing this had been the flight of the Wright brothers from Paris to London in 1903.